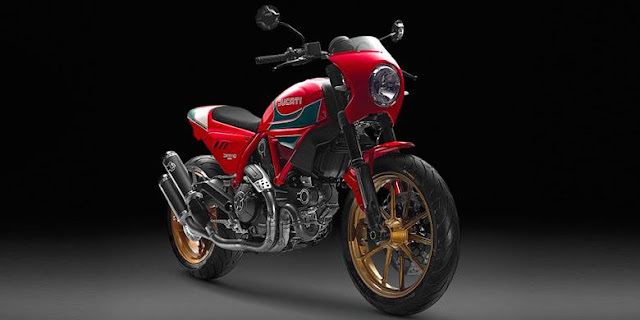 On the basis of memories of the triumph of the legendary racer Mike Hailwood, Thailand reported Ducati will launch a model based exclusively Scrambler. The intention product will be launched September 2016, only 58 units. Ducati Scrambler "Mike Hailwood Edition" presented to commemorate the 58th anniversary, of the first meeting Hailwood with Ducati in 1958. Hailwood itself a rider in Grand Prix Motorcycle Road Race successful in the 1960's. Apichat Leenutapong, Thailand Ducati owner, began planning this idea, Kalla met with Hailwood's widow, Pauline in October 2015. Of such Ducati 200 Imola 1972, leads the thought to the special edition Ducati Scrambler, as reported Paultan.org, Thursday (24/3 / 2016). With a base of Ducati Scrambler Icon 2016 edition adopts Hailwood cylinder engine capacity of 803cc, air cooled V-twin, with two valves capable of spraying power 74 tk and Tosi at 68 Nm. Using the main part belonging to Scrambler Icon as its base, this special edition has a special design on the tail and side protection. Termignoni exhaust brands, making it look classic, along with graphic design on the body that is inspired mounts rims models in 1978. Hailwood radius, with the sides to be sprayed gold. Price Scrambler Ducati Mike Hailwood's edition, will be priced at 699,000 baht or USD 263 million. Sales will also be divided into two stages, the first 28 units, then the rest later.